Colton's Map of the World on Mercator's Projection. / Printed for J. & H. Miller, Columbus, Ohio. John and Henry Miller (fl. c. 1847 - 1861) were American booksellers and publishers based in Columbus Ohio. The J. & H. Miller firm was active during the mid 19th century. 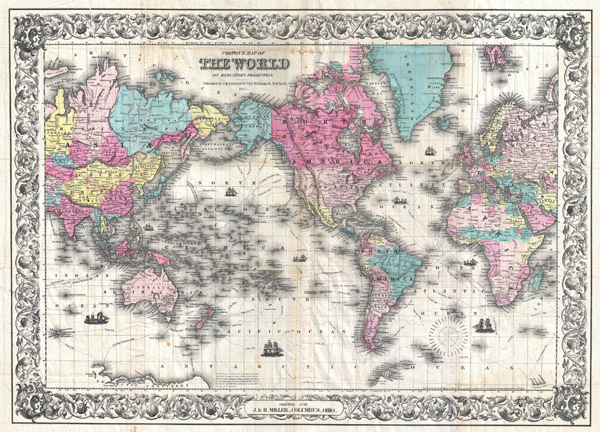 Though not specifically map publishers, the Millers published a number of historical works, many of which contained folding maps. The Miller firm is especially well known for its attention to African American related publications in the years preceding the Civil War. Very good condition. Professionally flattened with several minor archival reinforcements on verso. Wichita State University Library, Special Collections, 1856-0002.